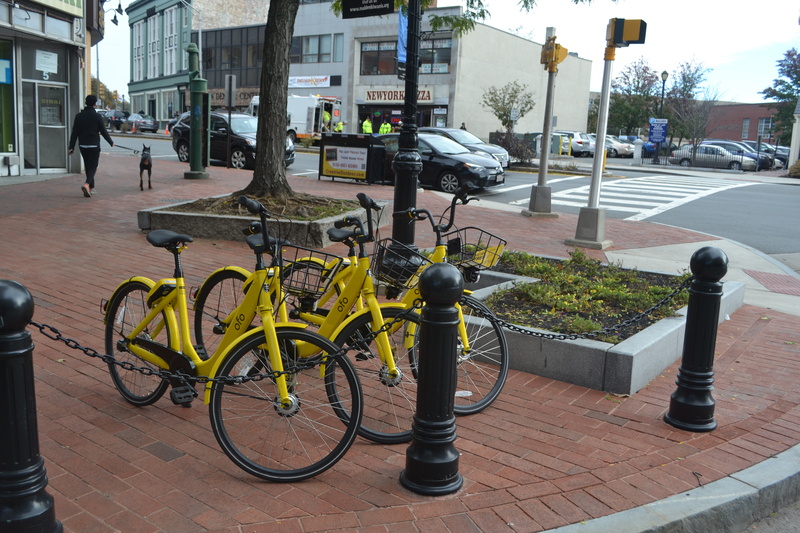 Ofo bikes on the corner of Main and Pleasant St.
Has anyone noticed the yellow and green bikes appearing throughout Malden? Originally, they were clustered on Pleasant Street, at the Malden train stations, along the Northern Strand Bike Trail and at other key locations. A little over one week later and you can spot them all over the city, now often parked in front of houses and apartment buildings. 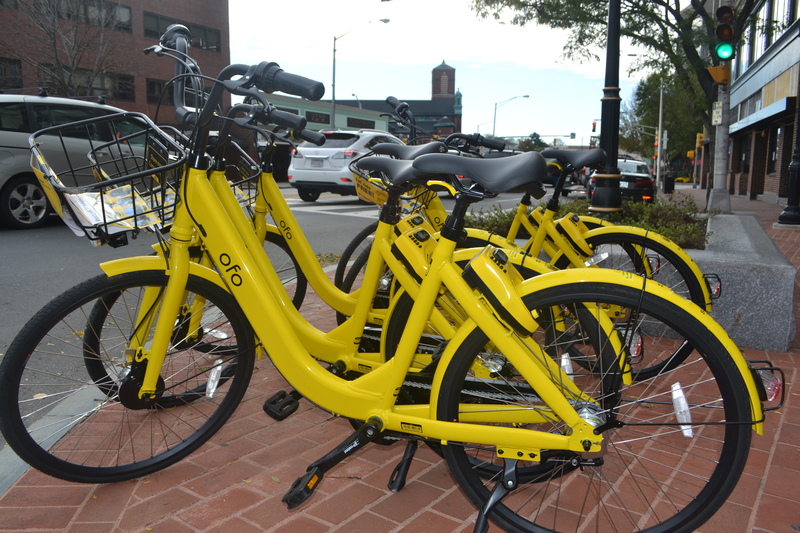 These bikes are the result of a pilot bike-sharing program, instituted by the City of Malden. 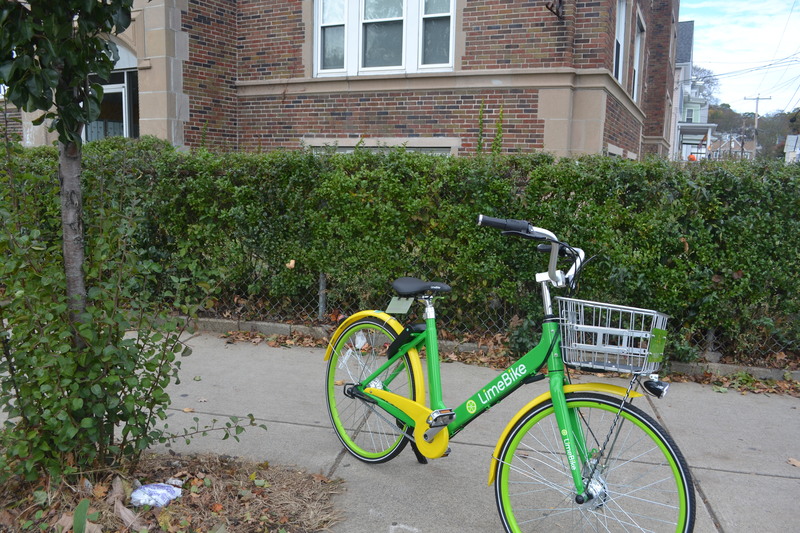 The city has made arrangements with bike-sharing companies, Ofo and LimeBike, which “each offer users a station-free biking experience,” according to the city’s web site. Ofo has the bright yellow bikes and LimeBike has lime green bikes. Thanks to the efforts of Councilors Ryan O’Malley, Councilor-at-Large Debbie DeMaria, and Mayor Gary Christenson, Malden residents can ride these bikes at the reasonable fee of $1 per hour, for transportation, or exercise or just for the joy of a bike ride. The “smart-bikes” are enabled with GPS, 3G wireless technology and self-locks. 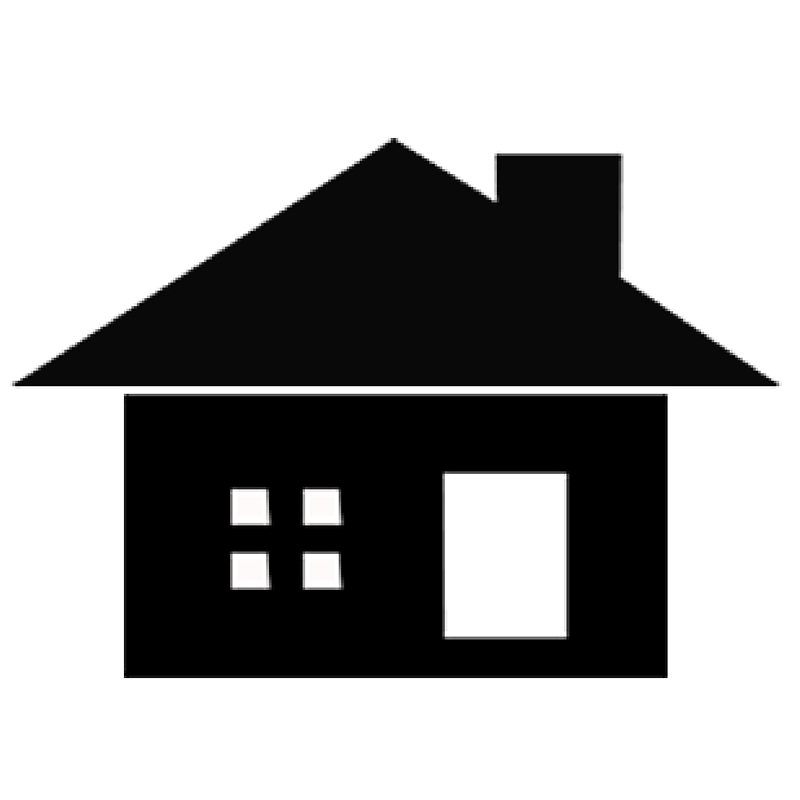 Users must download an app to a smartphone to arrange credit card or Paypal payment and to locate a bicycle. They then scan the QR code to unlock the bike. LimeBike parked outside an apartment building on Salem Street. Nearby the bike racks at Malden station, commuters and residents were interviewed about the new program, including cyclist Jim Smith, 64, and Anthony Gordon, 46, both from Medford. Gordon said he will use the bikes, and was curious about the program. He said if a cyclist gets a flat, he/she can get another bike at a very cheap price, a positive aspect of Ofo and LimeBike. Smith, however noted that not everyone has a smartphone, a potential problem. 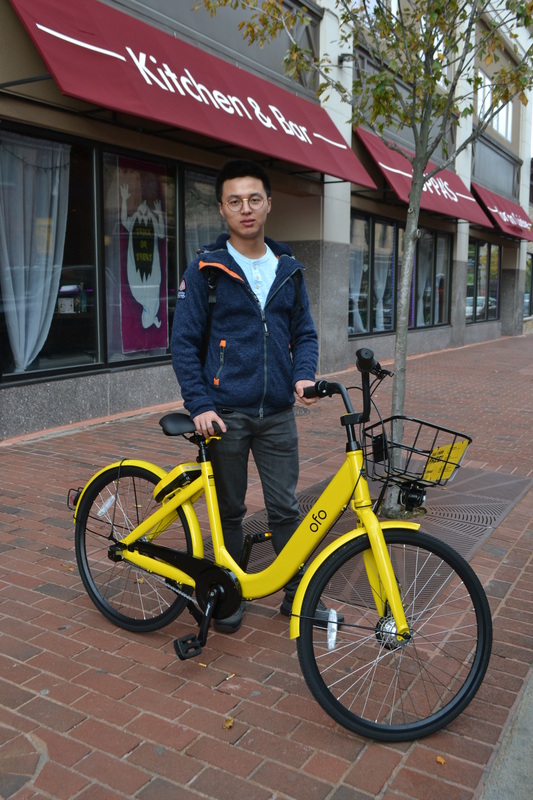 Ming Kun finds the new bike-sharing program convenient, inexpensive and easy to use. However, DeAndre Levarity, 30, of Malden had already downloaded the app. He said young people can use their parents’ credit account. Xiaoya Shen, 26, of Malden, just started using the bike program and really likes it. “You can ride a bike without buying one.” She finds the app easy to use. Like most new programs, a bike-sharing program is not without its issues. In an email, Mayor Christenson alluded to the need for the public to learn about safety. O’Malley cautioned about users being responsible and using traffic laws. Ofo was founded in in 2014, and to date has more than 8 million bikes in over 180 cities across 16 countries. 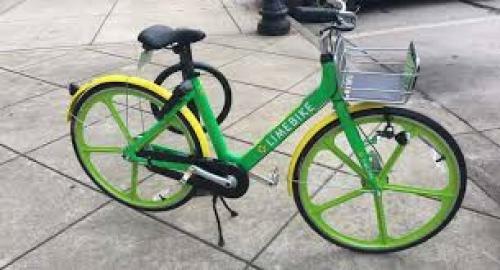 LimeBike was founded in January of 2017 and is headquartered in San Mateo, California, and has 50 employees. Malden is the first Massachusetts location for LimeBike and Holy Cross College in Worcester is their first Massachusetts college campus. Nekita Lamour is a Malden resident, an educator, and a citizen reporter for Neighborhood View. 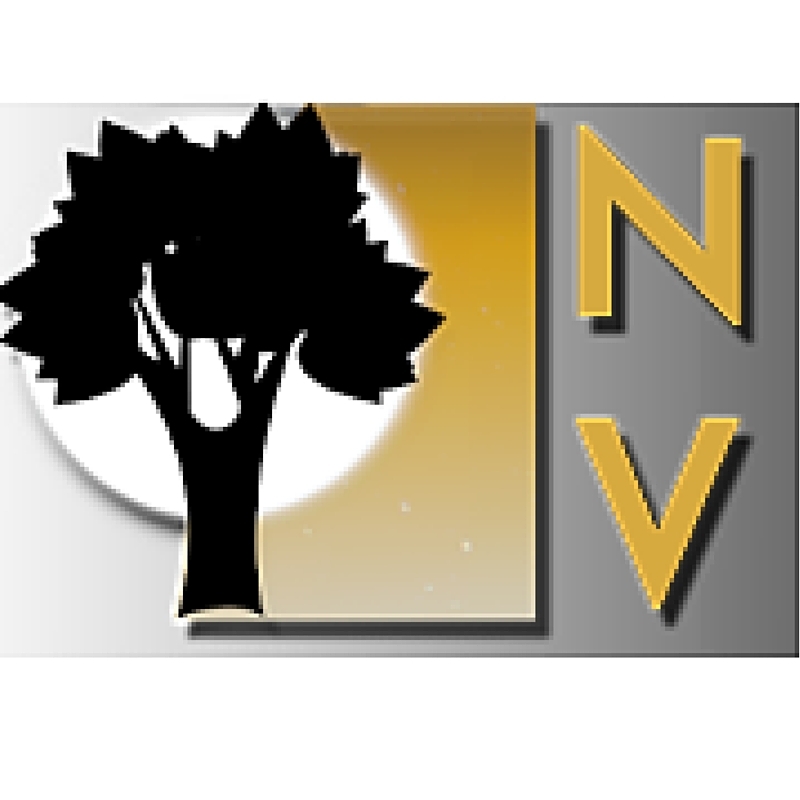 Anne D’Urso-Rose provided additional reporting for this article.